Central Park is one of New York City’s most popular attractions. It’s safe to say that there is plenty to see there as it’s home to seven bodies of water, 25,000 trees, 58 miles of paths and 250 acres of lawn. We doubt you’ll have time to visit every inch of it, so here’s what you simply must see in Central Park. It’s amazing to think the zoo is just next to the buzz of Manhattan. There are over 130 species inside Central Park Zoo, including snow leopard, sea lions, bears, penguins, red pandas and snow monkeys. The latest addition is the Tisch Children’s Zoo where smaller children can get closer to farm animals. 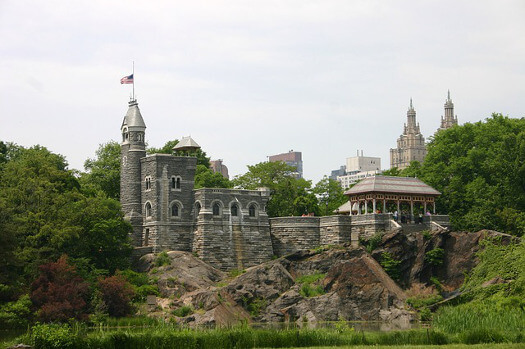 Head to Belvedere Castle for the views it offers of the park. That’s exactly what its name refers to. It’s a great spot to see the Great Lawn and the Turtle Pond. The National Weather Service also uses it as a weather station. 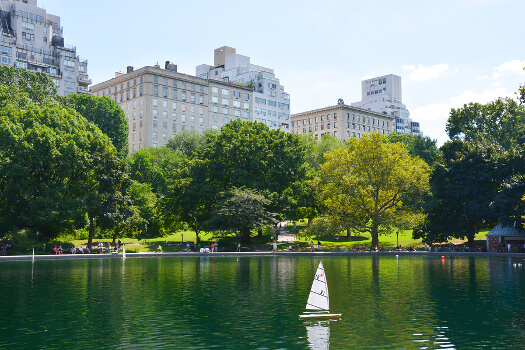 Conservatory water is boating lake for model boats that was modelled on the similar lakes, which were popular in 19th Century European cities. Head along today to sail your model boat, or just to watch others at play. 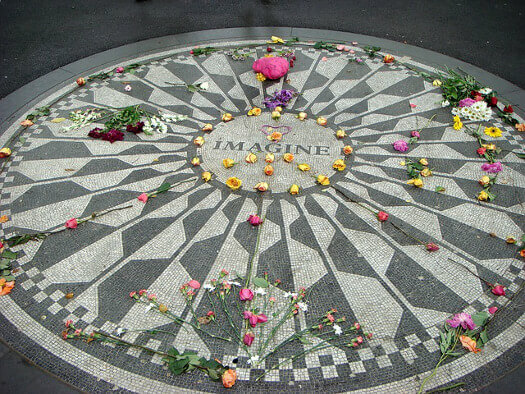 Here you will find a tribute to John Lennon, member of The Beatles, who lived and died in New York City. He was adopted by New York and frequented the park regularly so it’s fitting there’s a memorial here. 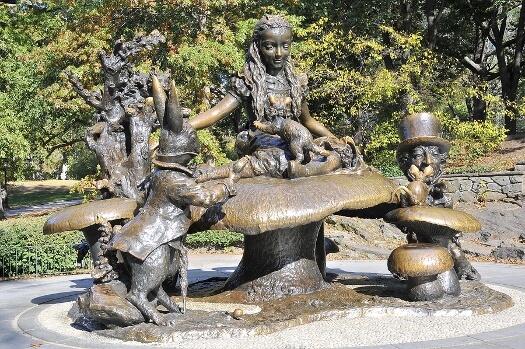 Close to the Conservatory Water is the Alice in Wonderland Statue. It’s a bronze tribute to Alice and her friends and is big enough for little ones to explore, or bigger ones to reminisce and marvel at. It was installed by George Delacorte, a businessman and multimillionaire, as a tribute to his late wife who loved reading the story to their children. The Victorian Gardens open later in May 2017. They open each summer at Central Park’s Wollman Rink. It’s an old fashioned carnival, which we think is fun for all ages. Head over to find your inner child and enjoy magicians, clowns, jugglers and fair ground rides. In the winter, you’ll have just as much fun here on the ice rink – it’s a great place to skate when winter descends. It offers more space and is less busy than the Rockefeller center. This month, April, will see the Freidsam Memorial Carousel open to the public again. 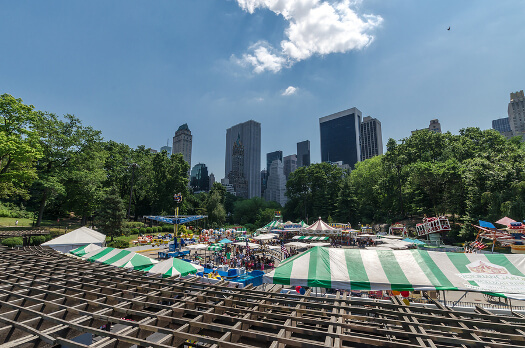 It’s been a favourite Central Park attraction since the first carousel arrived on the site back in 1871. It is a real classic. Interestingly a horse walking on a treadmill powered the first carousel. Times have changed now. At $3 a ride, it is popular so try to show up early if you do want a ride. The open air Delacorte Theater in Central Park plays host to a Shakespeare production each summer. It is of a really high standard and a wonderful experience. 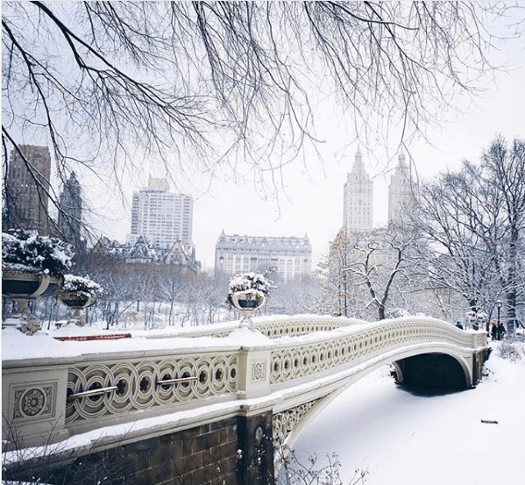 Head on over to Bow Bridge – you’ll find some wonderful views of Central Park from the bridge that connects Cherry Hill to the Ramble. It is also one of the most photographed locations in Central Park, so it’s quite an iconic spot for the visitor. Another recognisable icon of Central Park is the Bethesda Fountain that sits on top of Bethesda Terrace. It sits right in the centre of Central Park and there’s a wonderful view of the lake here. However, I really love this fountain for what it represents. The Angel that sits on top of it is called ‘Angel of the Waters’ and it was designed to mark the opening of the Croton Aqueduct that supplied fresh water to the city – its first safe water supply, reducing deaths and disease of the NYC population.